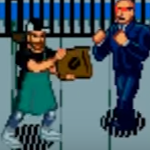 With two playable baristas in a classic beat ’em up, Coffee Crisis represents the deep love held for the pixel sidescrollers of the ’90s, pitting gamers against extraterrestrial beings that attempt to steal java and jams, not to mention the internet… with the team hard at work on the PC (Windows, Mac, Linux) version of the title, I chatted up Mega Cat Studios co-founder Zack Manko. Erik Meyer: As a retro console title, Coffee Crisis has players fight against aliens set on pilfering the Earth’s metal music, coffee, cat videos, and Wi-Fi, creating lighthearted commentary via a contrast with the typical reasons for invasion (resources, subjugation, etc). I’m interested in your take on the things people value and how we grow attachments to them; do you see these prized commodities as metaphors, or do you see cultural artifacts akin to gold and platinum? Zack Manko: It’s interesting, the impetus for the alien invasion being so inane is actually a metaphor for the enduring ennui that grips individuals in contemporary society. These “resources” can incite a full scale assault because the aliens, like us, lack any true meaning or purpose in our lives, and our only recourse to forget this gaping emotional, psychological, and spiritual hole is to become outraged over trivialities. Also, it’s totally bogus when someone jacks your Wi-Fi password, amirite? EM: You released the Sega Genesis console version of the game two years ago, so what kinds of technical hurdles came with that? As the hardware itself has been around for a long time, did you run into quirky coding issues that would otherwise not have existed? And as you’re now looking forward to the PC versions of the game, how has the migration of assets and engine elements progressed? ZM: There are always considerable challenges when developing games for 25 year old consoles, while trying to include the kind of experience a modern gamer can appreciate. To fit in all the content and artwork that we want, we definitely have to get creative and get smart with how we organize our assets and plan our games. We’ve actually developed new techniques and contributed to the retro dev knowledge base, to squeeze more juice from these beloved consoles. EM: The visual look of the game couples with the beat ’em up play style to make for a surreal (at times) experience, incorporating coffee, cosmic horror, possessed guitar players, and so on. Given the original release as a Sega title, what forms your asset design philosophy, and how do you keep things consistent? ZM: Pixel art is definitely the foundation of our aesthetic. It is really part of the mythology of video games, a style that someone sees and instantly thinks “video games.” The 16-bit style’s popularity to this day definitely marks it as timeless and something we can apply over any console or platform. EM: I like this connection to coffee (as a former barista myself), so as you incorporated the lexicon and accoutrements of the profession into your work, where do you draw the line regarding things the public wouldn’t readily be aware of? Things like tamps, portafilters, and Toddy cold brew might deepen the experience but require explanation, so when it comes to personal interests, how do you keep from overdoing it? ZM: We always want our games to be fun and interesting, but also relatable. Coffee and coffee culture are so prominent that we knew it would be a big win with a lot of people, and anything that was “too deep” of a reference would just be a special Easter egg for those with an extra cup of coffee knowledge. EM: You’re anchoring the game in Pittsburgh and including landmarks like the Duquesne Incline, PNC Park, and Grandview Boulevard, similarly drawing music from the local metal band Greywalker, so what advantages come with keeping the setting in the Mega Cat Studios backyard, and have any hurdles come as a result? ZM: Keeping things local has definitely enabled us to create some pretty cool partnerships and gather local support. In fact, Coffee Crisis originated as a means for supporting local businesses. Pittsburgh is a great city and provided some pretty fitting backdrops for cosmic battles. EM: In sidescrollers, overlords and bosses provide climaxes within level progressions, so can you describe what requirements and criteria make for a good/interesting boss, from a dev point of view? What additional challenges do you present to players, as compared with foot soldiers and drones? ZM: Boss bottles are always meant to be these exciting WOW moments for players. We try to borrow cues from other genres to keep boss battles interesting. For example, shmups often have gigantic, screen-filling bosses that are exciting and intimidating. This design philosophy definitely inspired the game’s final hideous overlord. EM: You add random modifiers to power-ups and mini-games, so how do these things effect game balance and replayability from the design end? Do you worry that a particular playthrough may be overpowered and make subsequent playthroughs underwhelming? ZM: Randomization from a design end only adds to replayability. Each playthrough becomes a unique experience, and the game always promises something new for players, to keep the fun flowing indefinitely. On the other hand, there is something to be said for a “pure” experience, so players looking to master an unfiltered version of the game can always turn the mods off. EM: Mega Cat Studios has already created a fair number of titles (Log Jammers, Bite the Bullet, Little Medusa, Justice Duel, Almost Heroes, Expedition, Creepy Brawlers), so as the PC version of Coffee Crisis has been in progress for a few years, what does your work look like in the context of these other projects, and what lessons have come from these games? ZM: Retro gaming is booming, and it’s always been our goal to be a cornerstone of the Retro Renaissance. To do that, it means pushing forward with multiple projects simultaneously. This can get stressful, yes, but it also enables us to learn techniques in one game that we can apply to our other games.